Organic watermelon extract, vitamin E and organic glycerine, this wonderfully fresh and fruity shower gel and foam bath is ready to nourish and revitalise. 100% natural fragrance, with organic watermelon extract. Free from parabens and SLS. Aqua (Water), Ammonium laureth sulfate, Maris sal (Sea salt), Polysorbate 20, Cocamidopropyl betaine, Citrullus lanatus (watermelon) fruit extract, Citrullus lanatus (watermelon) seed oil, Glycerin, Helianthus annuus (sunflower) seed oil, Tocopherol, Glyceryl laurate, Parfum (Fragrance), Sodium benzoate, Potassium sorbate, Citric acid, Anthocyanins, Limonene, Linalool. Below are reviews of Watermelon Shower Gel & Foam Bath - 400ml by bodykind customers. If you have tried this product we'd love to hear what you think so please leave a review. 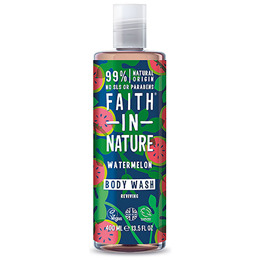 Love Faith in Nature products, and much prefer the old design packaging like this, much better than the new bright gaudy cheap nasty looking designs. The new design packaging is hideous and doesn't represent how natural and high quality this product is, shame.